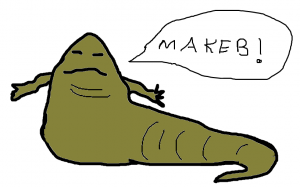 When Makeb launches, a big reset button has been pressed. Everyone’s gonna have to get to 55, and everyone’s going to have to completely re-gear. It will be a bit easier to get a jumpstart if you start out with the superawesomemegapwn (TM) gear of this tier, but it’s not required. Now, for me, do I still want to be a sentinel? I have a scoundrel and a gunslinger at 50, plus a merc on the sithie side. My boring consular is at level 41 with a month of double-xp weekends looming.1 I could conceivably change my main by simply leveling one of my other toons to 55 first, even if they are geared like crap, because I’ll have to re-gear no matter what. No muss, no fuss, no extra effort on my part or the part of my guildies. Are you planning to make any changes for the expansion?